cGMP Assay Kit ab65356 provides a direct competitive immunoassay for sensitive and quantitative determination of cGMP level in biological samples. The cGMP assay protocol uses the recombinant Protein G coated plate to anchor cGMP polyclonal antibody. cGMP-HRP conjugates directly competes with cGMP from samples for binding to the cGMP specific antibody on the plate. After incubation and washing, the amount of cGMP-HRP bound to plate can easily be determined by reading OD450nm. The intensity of OD450nm is inversely proportional to the concentration of cGMP in samples. The kit provides a new acetylation procedure that improves detection signal significantly. The kit can detect 0.04-10 pmol/well (0.008-2 µM) cGMP samples. Previously called cGMP Direct Immunoassay Kit. Cyclic guanosine monophosphate (cGMP) is a cyclic nucleotide derived from guanosine triphosphate (GTP). It serves as a second messenger in a manner similar to that observed with cAMP. Peptide hormones, such as the natriuretic factors, activate receptors that are associated with membrane-bound guanylate cyclase (GC). 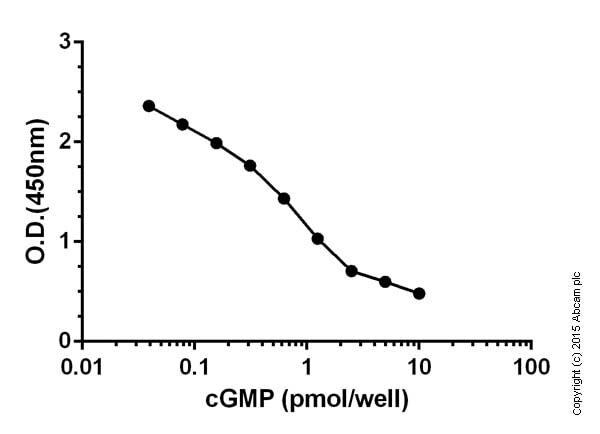 Receptor activation of GC leads to the conversion of GTP to cGMP. Nitric oxide (NO) also stimulates cGMP production by activating soluble GC, perhaps by binding to the heme moiety of the enzyme. Similar to cAMP, cGMP mediates most of its intracellular effects through the activation of specific cGMP dependent protein kinases (PKG). Publishing research using ab65356? Please let us know so that we can cite the reference in this datasheet. How can the 155 uL be dried after step 8 (as mentionned on page 10 of kit booklet)? You can use a speedvac to dry down samples. We are experiencing difficulties detecting cGMP levels in our sample of THP1 cells. Can I ask how to “dry” the acetylation reagents in step h? After adding the acetylating reagent mix, incubate at RT for 10 mins, then put the tubes in a laminar airflow hood or simply air-dry. 5ul will dry-up fairly quickly. For low amounts of cGMP, add 50-100ul of the assay buffer to dried tubes and then proceed with quantification. On page 7 the section b of assay protocol states "for suspension cells collect by centrifugation. Add 1 ml of 0.1M HCl for every 35 cm2 of surface area (e.g., 10 cm plate at 70% confluency is ˜110 cm2, so use ˜3.1 ml). Incubate at room temperature for 20 minutes on ice." This means you need to centrifuge out the media. The volume to HCL can be calculated as per the instructions given. How to reconstitute the components? The protcol booklet has been updated with missing information. Please check. According to the protocol, the cell culture samples are prepared in HCl. We then need to measure the protein concentration. 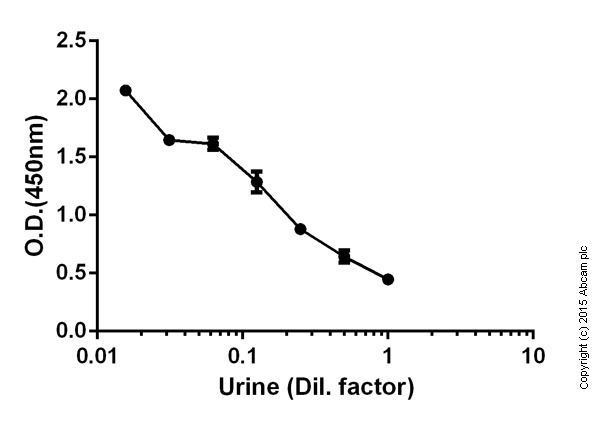 Please confirm which protein assays are suitable for use with this type of acidic buffer. Could BCA or Bradford be used? Thank you for your recent telephone enquiry. I can confirm that the Bradford assay can be used for protein quantifation with this kit. The BCA protein assay is not compatible with the acidic buffer in the samples you would have prepared with this kit. I hope this information has been useful for you. Please do not hesitate to let me know if you have any other questions. After preparing samples by scraping adherent cells in HCl and pelleting insolubles, can the supernatant be stored prior to quantifying cGMP or does the supernatant need to be used immediately? Yes, the supernatant from this extraction can be stored at -80°C in aliquots for later analysis. what is the best method of blood collection when using this kit? We don’t have a recommended protocol for collection of blood for this kit. I would just suggest storing the blood on ice before processing it for serum/plasma collection. Hope this information has been helpful for you. Please let me know if you have any other questions.